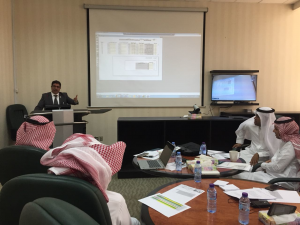 In the presence of the Dean of Admission and Registration Dr. Hashim bin Ahmed Al-Samadani, the Deanship of Admission and Registration and Information Technology organized the third Admission Workshop on Wednesday Sha'ban 23, 1439 H at the deanship's meeting hall Abdyia based campus. The meeting was attended by the Vice-dean of IT for E-transactions, Dr. Atif Al-Hejaili, Head of Applications Department Eng. Ashraf Asfour and the Eng. Hussein Al-Zahrani. The Deanship of Admission and Registration was represented by Dr. Khalid Al-Thaqafi, Vice Dean of Al-Qunfudhah Dr. Ali Al-Zubaidi via the closed TV circuit and the team of Admission department. 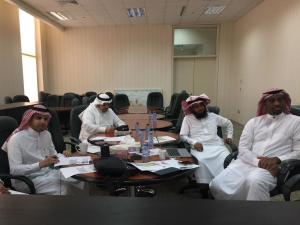 The meeting was attended via the closed TV Circuit also by the Vice Dean of Admission and Registration Dr. Fatima Al-Zahrani and the Admission team in the females' section. The workshop started with a welcoming speech by Dr. Khalid Al-Thaqafi, which was followed by the shedding light on the achievements made in the 1st and 2nd admission workshops. The presentation was made by Dr. Atif Al-Hejaili including admission's stages and procedures and the themes of the third workshop. It should be mentioned here that such workshops come to achieve the objectives of the Deanship of Admission and Registration in facilitating all procedures by harnessing smart technology in the admission process for the new students. At the conclusion of the workshop, Dr. Khalid Al-Thaqafi extended his thanks to everyone and valued their keenness to attend the workshop.